It was an unexpectedly long and busy visit to the ‘farmhouse’ this last week with family matters both fun and serious. But we made the most of the stressful times by getting some therapy painting done! 😉 It wasn’t in the plan to do a makeover, however we were glad we made the time. We worked so feverishly on this newly acquired auction piece that we even forgot to take “before” pictures. The prep work was already finished and paint was on the dresser before we even remembered the camera! Whoops..
For your convenience in locating products we have used, this article contains affiliate links. All products are items we use ourselves and genuinely recommend. For our full disclosure go to our “Disclosures” page. That’s O.K. though, the “after” pictures are too pretty not to share with you all. We knew this small piece needed to be a bright and beautiful color to kick it up a notch. The old finish was a really light honey oak color, with random dark red streaks in it. We weren’t really sure what kind of finish that was, but it looked strange, so we just decided to cover that up! Prep work began by filling some small holes, and scratches on the top with our favorite wood filler, and when that was dry we sanded the entire piece down lightly with a fine grit sand paper. 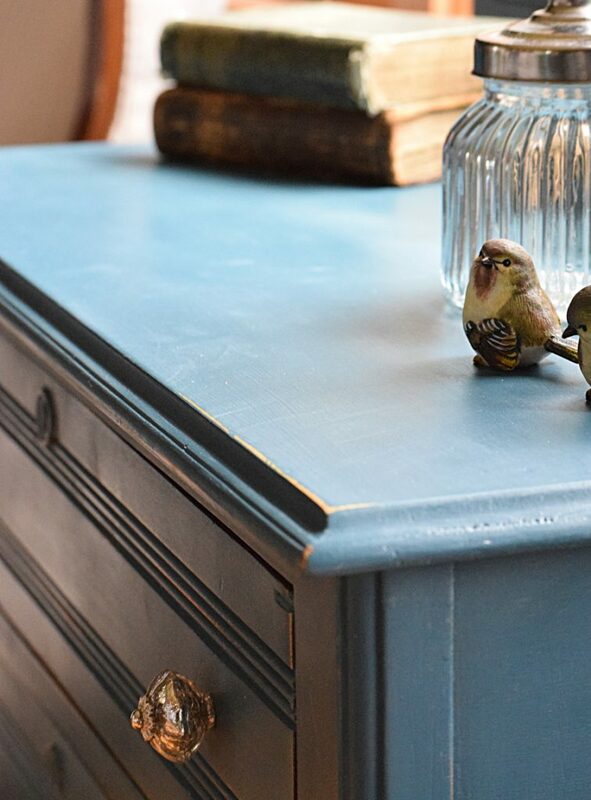 I had actually forgotten that we had recently purchased Annie Sloan’s “Aubusson Blue” until I went to dig through the paint cupboard to find a color that spoke to me. Well “Aubusson Blue” pretty much shouted “Pick me, pick me” as soon as I saw it. I got all excited and knew that was the perfect paint for this piece. 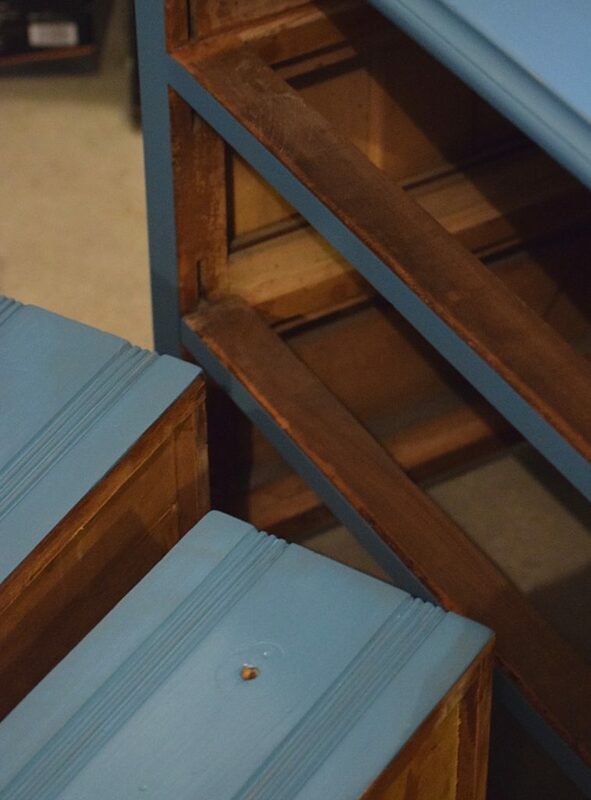 Only one coat of this perfect blue was applied since it covered really well and I planned on distressing it anyway. 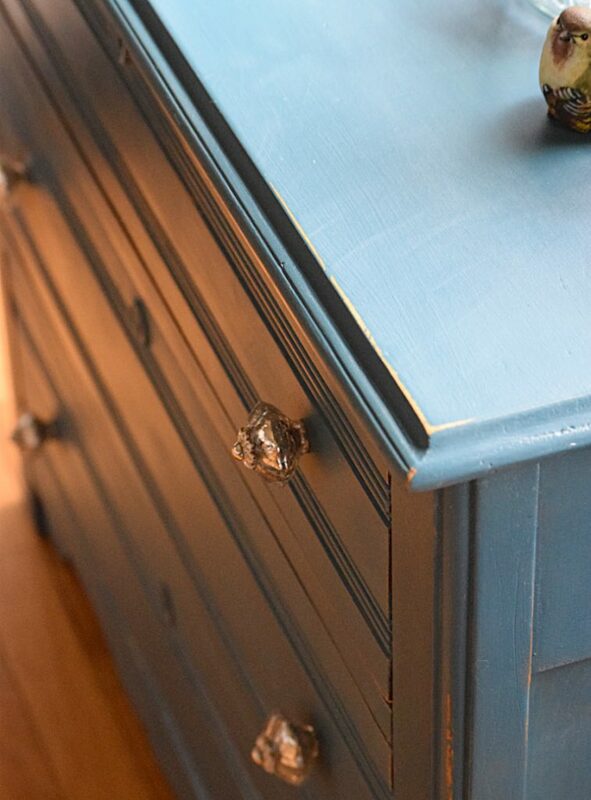 Once everything was dried, we applied one coat of Annie Sloan’s clear wax and buffed before distressing. All we did to give this piece a little bit of an “ooomph” was to softly sand with a fine grit block over the edges and corners. It took off the blue to show that wood color underneath. We left it very softly distressed around where normal wear-and-tear would have taken place. Then again we put another coat of clear wax over the entire piece to make sure it was completely sealed. 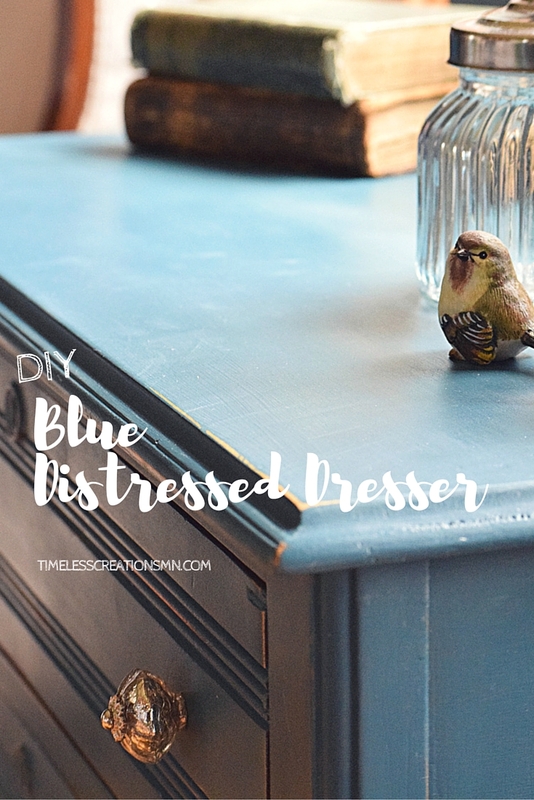 We went right over the distressed parts and then buffed the entire dresser with a clean rag. 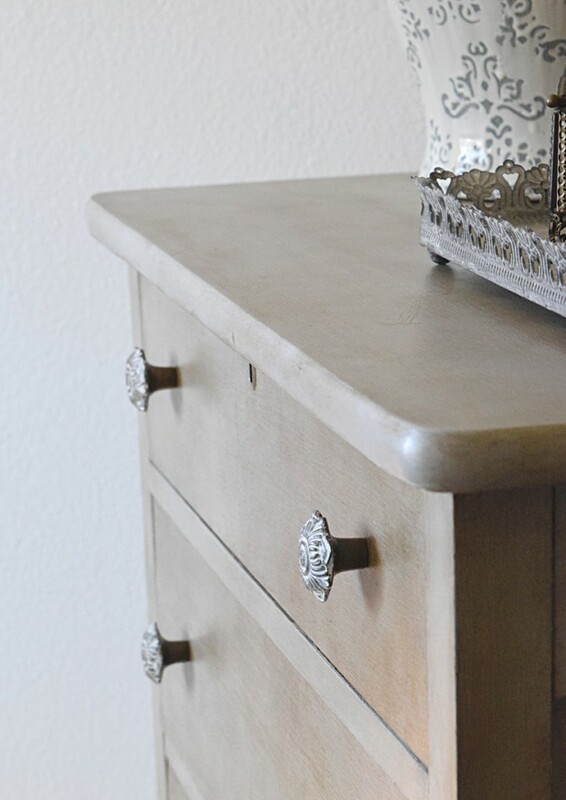 We also grabbed some beautiful mercury glass decorative knobs to add to the overall look. That was it! This was such a quick transformation and was really very easy. 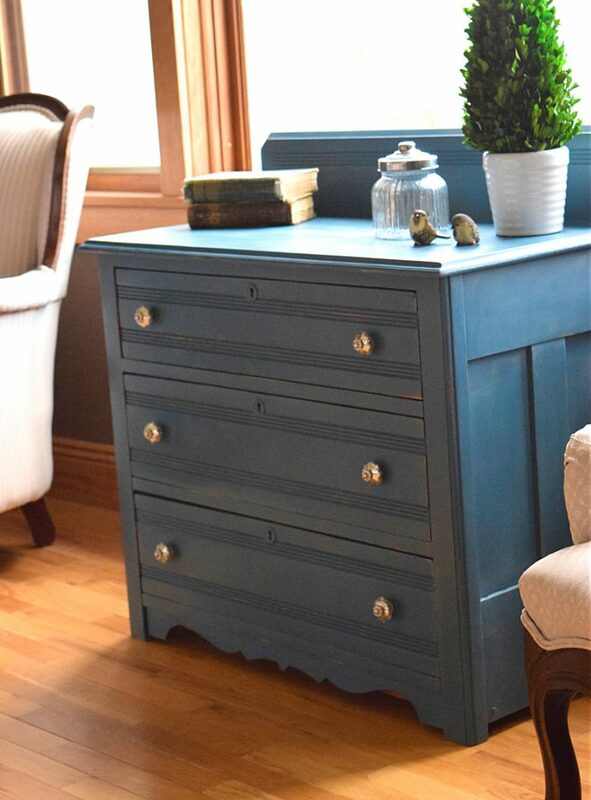 Annie Sloan’s paint covered almost perfectly with that one coat and is always very easy to distress since it is chalk paint. 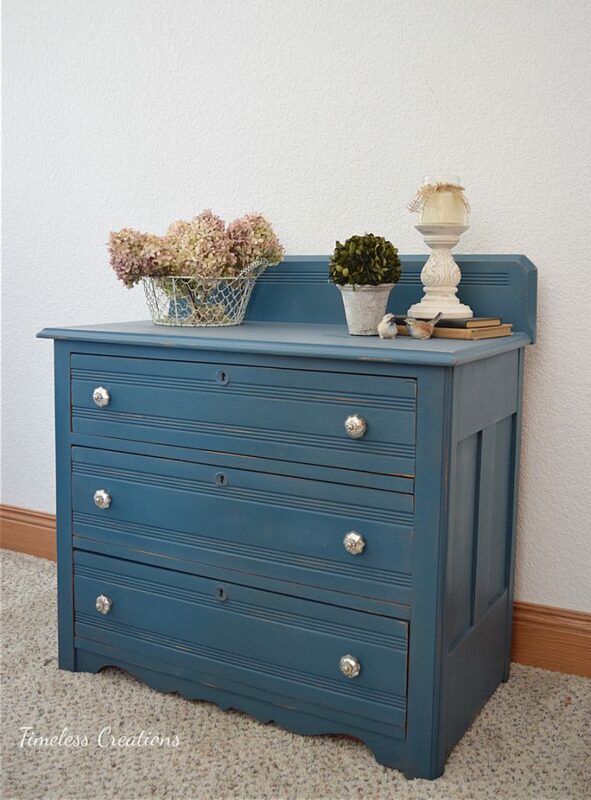 This plain little dresser is now transformed into a bright and beautiful accent piece perfect for any home. 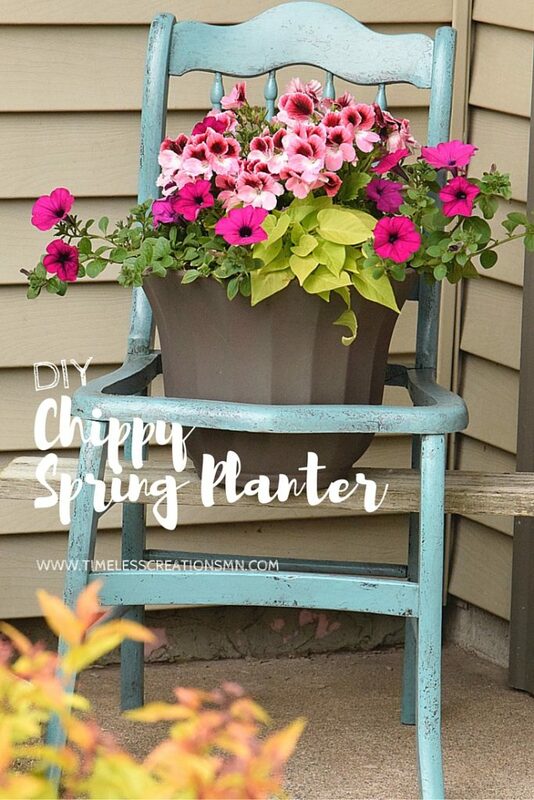 It could work as a bedside table with light bedding, or a side table in the living, or even as a pretty entryway table with a mirror or architectural piece above it! Thank you so much for visiting and pinning Laurie! I had already seen and pinned this to my before and afters board (love that blue!!) now I’m pinning it to the To Grandma’s House we go link party! Thank you for sharing it with us! Thanks so much for sharing! That blue is one of our favorites also! 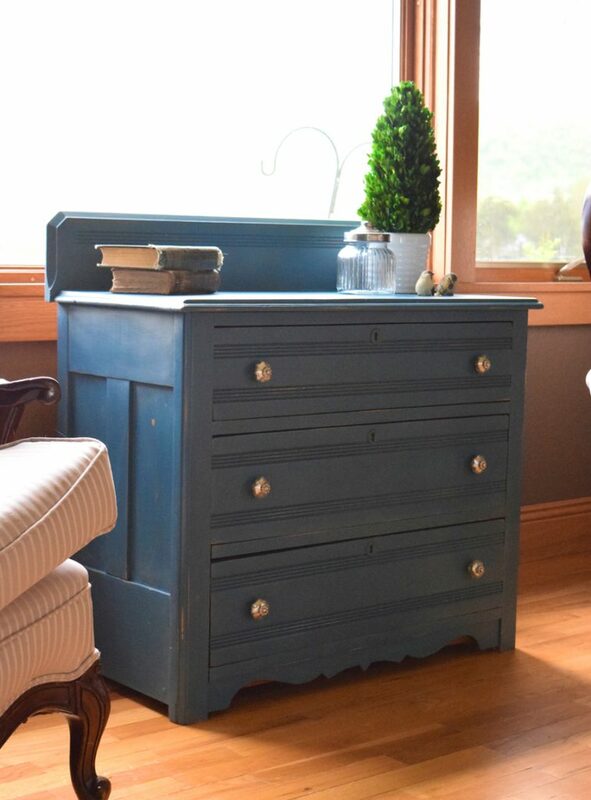 It is beautiful and I love the colour and the knobs!! 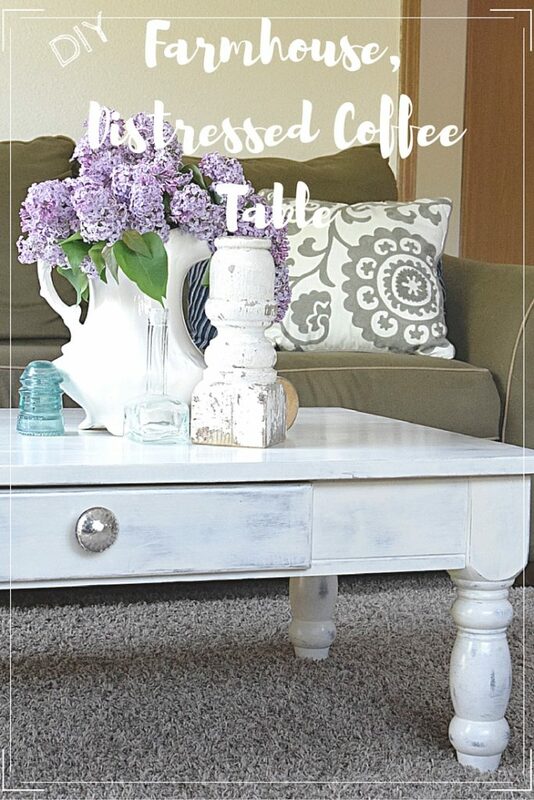 This could work in any room with any kind of decor, it’s so pretty! Thank you so much Katrin! That is how we felt, could be used anywhere! You picked the perfect color for your vintage dresser makeover. I am featuring it at Snickerdoodle Create-Bake-Make party today. Thank you so much for the feature Sharon! We appreciate it 🙂 Oh that blue is so gorgeous. 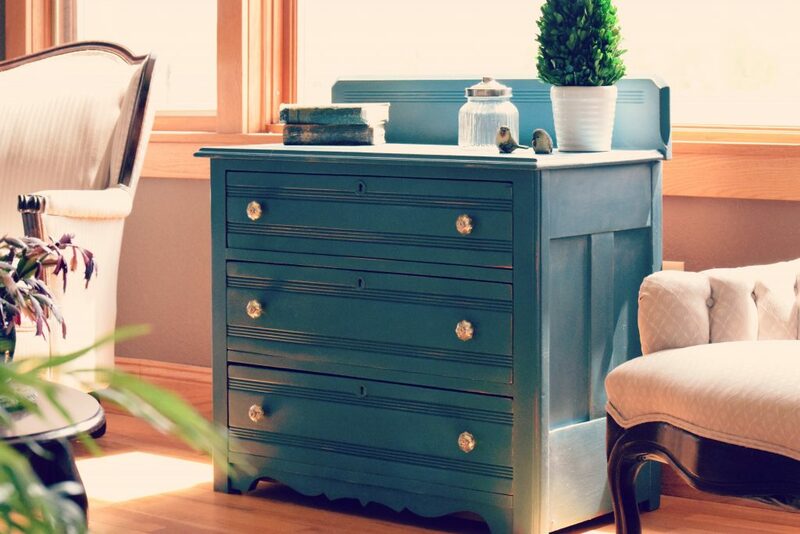 This is such a stunning piece of furniture and the color is equally stunning! Thank you Angie! We absolutely love that blue color too! This is so pretty. 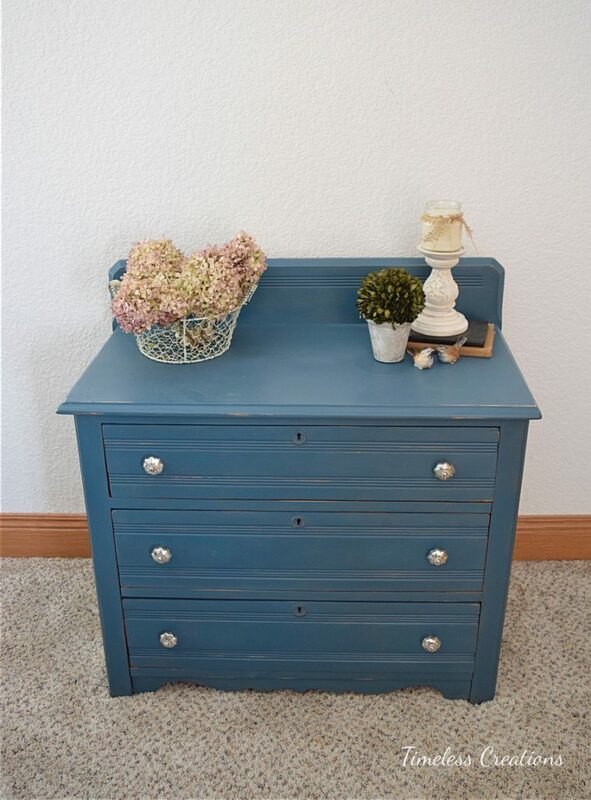 I like the lines of the dresser and the color brings out the beauty of it. Oh we just adore this color! Thanks for visiting! 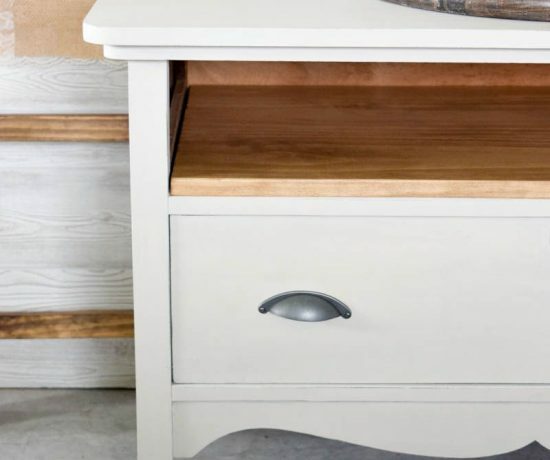 wow this dresser looks so beautiful. You ladies did such a good job!! Just lovely! I could look at that shade of blue for hours. Thank you for sharing at Monday Social. Thank you Eilis! That blue is one of our favorites for sure. This piece could live at my house. Pinned to my French Bleu board. Are you keeping it or selling it? Thanks so much Judith! This one actually already sold. Pretty quickly too! We have another a tad bit bigger dresser that we are painting the same color too!